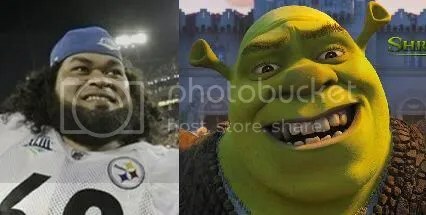 It’s been a couple years since we went through the ugly mugs on the Pittsburgh Steelers’ roster, so what better time than here in Steelers Hate Week 2011 (Part 1) to take a look at the hideous beasts that are coming to M&T Bank Stadium on Sunday to try to ruin our weekend. Granted, roughly 51 of the 53 men that only wear logos on one side of their helmet have faces only a mother can love. Surprisingly, though, there’s actually a couple guys on the roster who wouldn’t send young children screaming in the other direction upon laying eyes on them. Hell, I’m pretty sure I’ve seen hordes of teenage girls running AT punter Daniel Sepulveda. Personally, I’m relieved that Smith/Miller is on the job up there in the Appalachians. 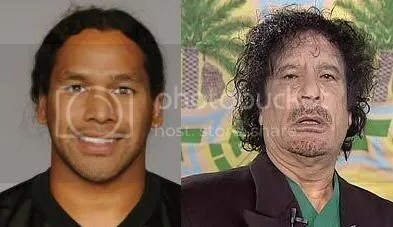 Not only do the Steelers harbor terrorist sympathizers like running back Rashard Mendenhall on their roster, but word has it that recently deposed Libyan dictator Muammar Gaddafi is hiding out up there as well. Yikes. Save us Heath Miller, you’re our only hope! All this serious talk about CIA agents, terrorists, and dictators has me a bit on edge. What I need is a friendly, good-natured ogre to talk to his pet donkey and cheer me up. Luckily, offensive lineman Chris Kemoeatu is here to oblige. Finally, while this one probably would have fit in better with 2009’s Xmas edition, defensive lineman Brett Kiesel didn’t have this woodland creature living on his face back then. Like his doppelganger Yukon Cornelius, Kiesel went hunting for valuable metals last winter. Of course, he happily came up empty in his trek for a Super Bowl ring, thanks to Aaron Rodgers and the Green Bay Packers. Steelers-Ravens kickoff is in just about 98 hours. Hopefully in 101 hours or so, these goofy looking mofos and their entire team will be headed back west bruised, beaten, and defeated. 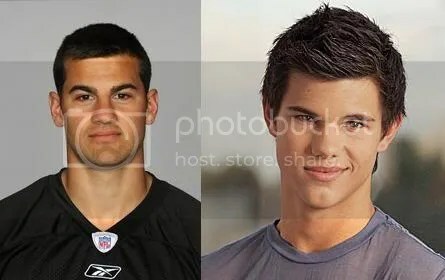 This entry was posted on September 7, 2011 at 10:04 am and is filed under Hating, Humor, lookalikes, Ravens. You can follow any responses to this entry through the RSS 2.0 feed. You can skip to the end and leave a response. Pinging is currently not allowed.